Katlego Maboe is a South African singer, songwriter, accountant and television presenter best known for co-hosting the magazine shows 50/50 on SABC2 and Expresso on SABC3. A qualified accountant, Katlego is an MC, TV presenter and singer with the acapella group Flip a Coin. The group has performed live on the M-Net shows Huisgenoot Skouspel and Idols. He was born and raised on Potchefstroom. 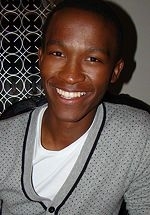 Katlego made his television debut as himself - a staff member at the magazine DEKAT - in the SABC3 magazine show of the same name, in 2009. He was subsequently booked by 50/50 as a presenter and from there was headhunted to Expresso. In 2014 he co-hosted the seventh season of the SABC3 reality competition series Strictly Come Dancing with Roxy Burger. The duo returned in 2015 to host the eight season (the second for each of them).